Today we proudly (a little too proudly) present the sequel to last month's Sizzling Cicada Spectacle: THE BODACIOUS BUMBLEEBEE BONANZA. 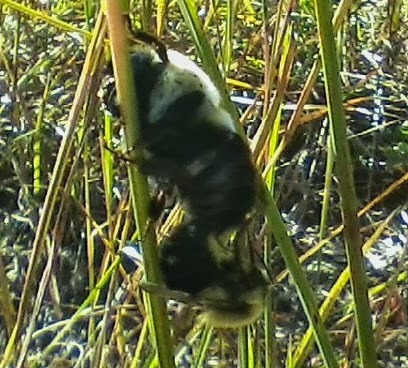 So I was out in the meadow beneath the power lines today and caught a couple of bumblebees in the act. I'm no entomologist, but I know the bigger one is definitely a female (a future queen), while the smaller is definitely a male (who just buzzes off and dies now). And I'm learning that insects, despite their speedy busybody bustling around, seem to be really slow when it comes to mating (as it were). I had to wait a few minutes before the wind died down enough for a clear and unobstructed shot, and the bees hardly budged in the meantime. From a mammalian perspective, it seems peculiar and comical, but it makes perfect sense! When you're a small, squishable, easily-stirred creature who requires several minutes to give and receive gametes, you'll have a better chance of success if, when necessary, you're able to relocate to a safer position without putting the transaction on hold. Critters like us, enabled by our superior powers of perception and cognition to recognize a secure place and time from the onset, had less reason to develop coitus on the go capabilities over the course of our species' evolution. But can you imagine if we shared this ability with our fuzzy and buzzy brothers and sisters?! No, I won't type what I'm thinking, but it might involve my lady friend and a game of miniature golf. "Now take me to the next hole, my dear! Hahahaha!" "Wait! Come back! You have my scorecard!"